Nationality: Bio analysis believes that Tarik is of 'Japanese and British' Descent. However, files believe to have been either corrupted or deleted. Appearance: EVA Pilot Tarik Noble currently stands at around 6' 1" (185.42 cm), and weighs in at 110 lbs ( 49.8952 kg). Tarik has Light blonde hair, with Light blue eyes, his hair style flows straight and the length reaches down to his mid back section. For casual clothing Tarik Noble wears light blue Jeans with belt, yellow Hoodie, Black Vans, White catholic necklace. Whilst on duty, the Eva pilot wears a Golden yellow color with a hint of light and dark grey that is the same color as the Eva Unit-06. Background: Origins or Heritage that is based on Tarik Noble has been deleted. However, it is stated that he has been raised in Nerv's 4th Branch Bethany ever since its foundation. In fact it is a confirmed information that Tarik was born within the center of the Branch, within its most darkest and secret halls of the confinement, yet however since his birth he was placed into a deep coma. Precisely 6 years after the second impact, a temple was discovered within the Deep Ice of the North Pole, where it is said it has existed since the final hours of the First Ancestral Species. Once the scientist first entered the facility and traveled into the very core of the temple, the building itself collapsed, killing hundreds of individuals. However, it was the same moment when Tarik actually awoken, and suffered from multiple flashbacks, flashbacks said to show the First Species and a prototype angel being created, but that was all. Accusations and questions about the child supposedly 'born' within the center of Branch 4 began to escalate to the point where he had to be transferred to Branch 6 'Eden' for his own security and safety. It was there for an years up to the age of 14 where Tarik began to learn advance EVA piloting, 24/7 tests and training was put onto him for optimal performance, following the chain of commands without question. But even in Branch 6 Tarik knew that many people do not trust him, considering how his personal files are either corrupted or deleted, yet regardless of the trustworthy performance by this particular eva pilot, Tarik Noble did show promising and highly reliable data piloting results from his tests, which in a way balances out any trustworthy accusations. Soon 3 months later, Tarik was once more transferred to Japan where he now currently resides in NERV HQ, awaiting new orders, and possibly a new home. Design: The Armour color design of Eva Unit-06 is a Golden yellow coating with hints of Light and dark grey, that matches the suit color that EVA Pilot Tarik Noble wears whilst on duty. Head design is both strong, and sharp, with a hidden jaw (that opens when gone berserk) and 2 yellow eyes for humanoid appearance. His helmet is a V shape visor, with a strong upper lower body Armour suit, for optimal defense and maneuverability. The latest features of EVA unit-06 is the Wing System that allows the Unit for self flight performance much like angelic wings from the mass production units. EVA unit-06 has 2 arms and legs, and a hidden sharp tail that only comes out if the Pilot is in a serious situation. 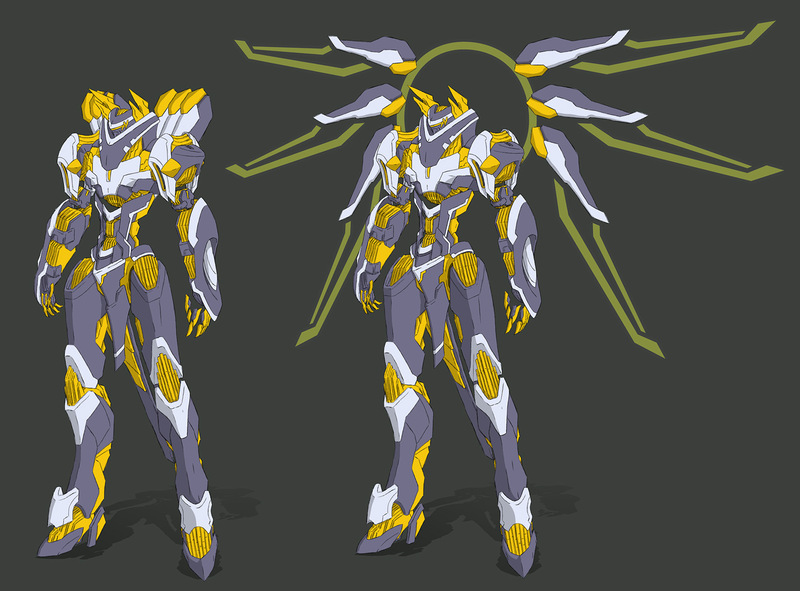 Purpose: Like any other eva units, to combat against the angels and to prevent any future impacts. Data has been collected and proven purpose results for 100% synchronization with the eva pilot. EVA unit-06 has been created for all around purpose from air to air combat, close, medium and very few circumstances long range mode fights. "The faithful has lost their faith." "The Incorruptible has become corrupted." "The true innocence has given way to the sins of Man. Like all the rest before them." D'aawwwww. I hope we see more of her. Also, sorry PrototypeAngel, but we've really began now. No room for new players. We~eeeeell... if you're interested in non-Eva roleplays, Atropos has an Utena RP going on that's not too late to join - check the Games and Gaming section in the Unrelated forum. In addition, I know there's a reboot of the Fate/Stay Night RP in the works. Agentomega wrote: We~eeeeell... if you're interested in non-Eva roleplays, Atropos has an Utena RP going on that's not too late to join - check the Games and Gaming section in the Unrelated forum. In addition, I know there's a reboot of the Fate/Stay Night RP in the works. How about starting your own RP? You could also go on /tg/ and see if anyone wants to run an Adeptus Evangelion game. That would require you to acquire the Dark Heresy rules, though. Squigsquasher wrote: How about starting your own RP? Eeeeh to be honest, I am not really good at making my own rp's. Atropos wrote: You could also go on /tg/ and see if anyone wants to run an Adeptus Evangelion game. That would require you to acquire the Dark Heresy rules, though. Careful. I do not believe this one is ready for that...place. Squigsquasher wrote: Careful. I do not believe this one is ready for that...place. Will get a post up today, hopefully. Since there is nothing really to respond to. I will skip this round. Sorry about all the delays, my computer problems made getting online annoying. Still, gonna get posting now, sorry again, hope I haven't killed this for everyone. I know, it was one of the problems I had making the post, since Qiuyi left, and unless Frederik did, there was really no way to avoid a run-in between the two. If you can think of a compromise between the two posts that works, I'll happily edit. Well it says in Squigsquasher's post that Qiuyi "carefully avoided Frederik" so I can take that to mean she didn't engage him... probably I'll just have him having had just said "hey" in the worthless sense. Alright, I'll edit it later today. EDIT: Edited the post, sorry for the delay, took a liberty with Frederik just to fill it out, hope that's cool. The new post was a collaboration by Lance and me. Frederik x Ro forever, at least until Abdiel. 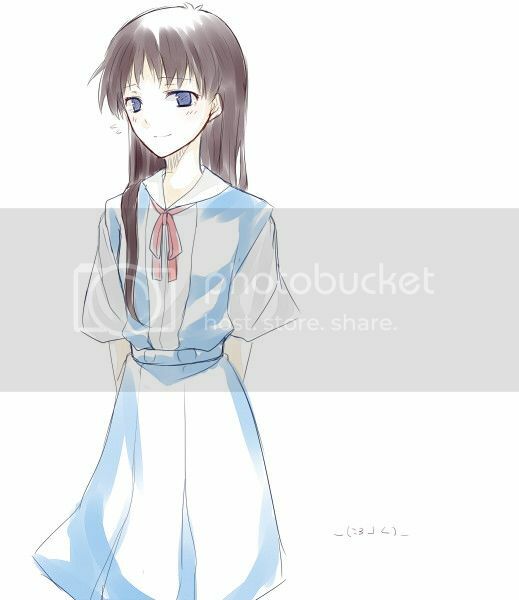 Now, I'm not going to force you to do this, but I do recommend that there be a timeskip a few days, to a time when Ro and Qiuyi are at Nerv for Synch testing together. Also I've rewritten the first Seele meeting and removed the second to better fit with my conception.